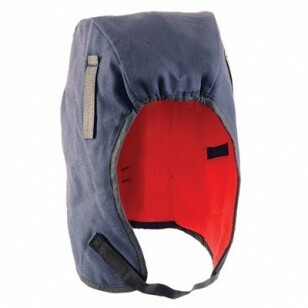 These all purpose Fleece Lined Hot Rods Liners are worn under hard hat to provide superior warmth in cold temperatures. Hot Rod Liners feature two built-in-pockets with a microporous non-woven material for ultimate protection for sensitive ears. These winter liners are designed with an elastic strip in the forehead, preventing unwanted cold air from entering. Another great feature these winter liners have is a unique strip of reflective film above the back of the neck. This strip provides wearers with added safety when working in low light conditions. Warmth, safety and a comfortable fit, what can be better? Sold in packs of 6. Cotton twill and binding are flame retardant until washed. Regular length. Available in navy blue. One size fits most.